One Clear Vision is teaming up with the UK’s leading eye research charity, Fight for Sight, to raise funds for DVS clinical research. And we really need your help! We will be taking part in this year’s CARROTS NIGHTWALKS, Fight for Sight’s flagship fundraising events: night-time sponsored walks taking in spectacular city sights. 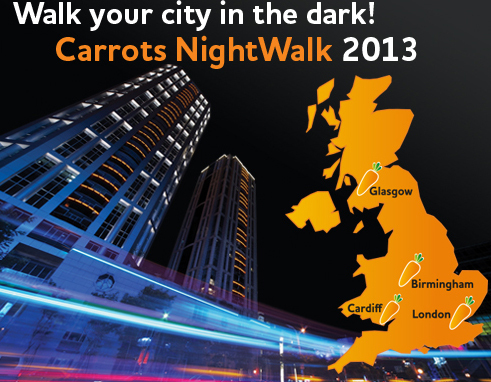 For the last two years, hundreds of Carrots NightWalkers have walked around London, raising over £200,000. This year they are building on this success and rolling them out to Cardiff, Birmingham and Glasgow. If you will be in the UK on September 20th, please join the OCV team on a walk in a city near you and help to raise these vital funds as well as to meet lots of other people interested in sight research. Walkers don’t need to have DVS or any kind of eye condition and all ages and abilities are welcome, so encourage your friends and families to join in. (select Degenerative Vitreous Syndrome as the destination for the sponsorship money). Then contact us and we’ll send you details for how to set up your sponsorship page as well as some handy materials to help you promote it. We only need 50 people to pledge to raise £150 in order to meet our target and apply for a vital research grant. Please support the Carrots NightWalks and raise funds for DVS research: not only will you see some of our cities’ most spectacular night-time sights, you’ll also remind yourselves and others just how much the ability to see is valued. Help to spread the word by linking to this article!